Melbourne's inner west has a reputation as one of the most hostile parts of the city for bike riders, with wide industrial roads filled with fast-moving container trucks and a shortage of paths across the Yarra River, a report has found. The report pinpoints the many missing links in the west's patchy bike network: on-road lanes that funnel riders into heavy traffic or which disappear beneath the wheels of parked cars; bike paths that end abruptly and force riders to navigate across major freight routes. Getting the West on Track was commissioned by the Victorian Greens as a guide to how Melbourne's west could catch up with other parts of the inner city, where cycling is booming thanks to safer paths. It argues building better bike links would reduce the area's heavy dependence on car travel, cut road congestion and improve health problems linked with a lack of exercise and higher vehicle emissions. 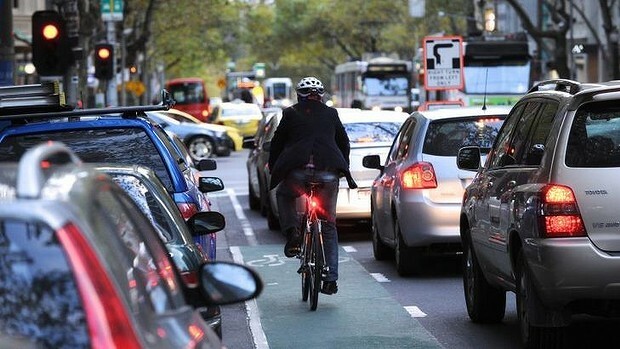 Victorian Greens MP Colleen Hartland said there were many people in the western suburbs keen to ride a bike and the government had a responsibility to make it safer for them. "The inner western suburbs have just one safe cycling CBD commuter route," Ms Hartland said. "This is just not good enough, particularly when you consider that, in the inner northern suburbs, every second road features a bike lane." Munro analysed VicRoads and Victoria Police crash data involving cyclists in Victoria from 2002 to 2012 to determine the most common causes of bike accidents. 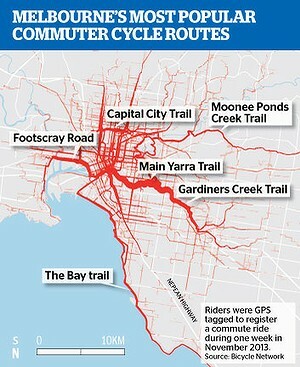 The research has been published on the Bicycle Network's Ride On website. "Our road system is fundamentally unsafe, and we implicitly trade off serious injury and death to allow us to drive fast and park in the most convenient locations," Dr Munro said. He said that in urban areas the greatest risk is usually in front of the bike rider - not behind. "Usually a crash occurs because a car turns across the path of an oncoming rider, or opens their door in front of a rider." Data showed the top three accident causes were cars cutting in front of riders, a driver hitting a rider side-on and vehicle doors opened into the path of riders. Moreland City Council is grappling with how to improve bike safety on Sydney Roads after a cyclist was killed earlier this year. There have been six cyclists killed on Victoria's roads in 2015 with 10 killed last year. Hundreds more are badly injured. Polite drivers leave a gap for through traffic from side streets. The bike rider continues unimpeded on the left of the traffic and a car heading in the other direction turns right through the gap. The view is obstructed and neither bike or car have time to react. A similar crash cause is "cross traffic": a rider heading straight ahead is hit side on by a car. Intersections are a big danger spot with crashes involving left turning vehicles. While bike riders can pass vehicles on the left, they are not allowed to do it when the vehicle is indicating and performing a left turn at an intersection. Riders should never assume a left-turning vehicle has seen them or will stop. Anyone who has ridden down Collins Street recently will be familiar with this cause of accident - "lane side swipe", bikes and cars too close. Sometimes it is careless drivers in many other cases it is poor road design. Almost as common as the lane side swipe is the rear end - a rider struck from behind. This is more common in country areas and can be deadly with vehicles moving at greater speeds. Wearing bright clothes, good rear light and sticking to the left as much as possible helps. And then there is the accident all parents are forever mindful of, cars backing out of driveways. This is particularly pertinent for kids on bikes heading to and from school. Dr Munro said one reason drivers don't see bike riders is a natural inclination to be cautious of things that can harm you - a car is a bigger personal threat than a bike. He said motorists also found it more difficult to judge the speed a bike is travelling compared with a car. Our roads are a complex environment. "Sydney Road is a classic example of this. There are all sorts of things going on. There is no way we as humans can completely comprehend all of those visual signals we are getting in that space so we have to simplify it so we implicitly look for those things that are most likely to hurt us," he said. Our roads can be safer, he said. Some suggestions include reducing speed limits, providing physical separation between bike riders and fast moving traffic and changing traffic signals to separate the movement of bikes and cars. And Dr Munro's advice for cyclists is to ride to the conditions, try to make eye contact with drivers, and assume drivers have not seen them. Chris Carpenter from Bicycle Network said all road users should slow down around intersections and the level of mobile phone use by drivers was too high. He also called on governments to develop better infrastructure like separated bike lanes along Melbourne's dooring hotspots, such as St Kilda Road, Chapel Street and Sydney Road. Two new segregated bike paths will crisscross the city and open up speedy, safe cycling that will ease pollution and traffic for everyone, non-cyclists, too, Boris Johnson says. London is a big huffing puffing city, so Mayor Boris Johnson’s success in pushing ahead with his plan to build cycle superhighways right through the heart of it seems nothing short of a small miracle. The “Crossrail for the Bike” will be 21 miles long and almost completely separated from motor traffic: 18 miles travelling east-west (from Barking to Acton) and 3 miles running north-south (from King’s Cross to Elephant and Castle). When completed in 2016, it will be Europe’s longest segregated bike path. 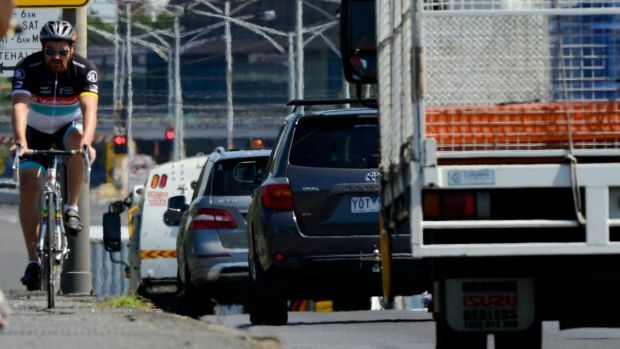 Their complaints hinged on concerns over gridlock, increased congestion, restricting delivery vehicle access and adversely affecting business in general. Also, some of London boroughs have been fierce opponents only caving under huge pressure and, in one case, threats to seize control of its roads, says London’s cycling commissioner, Andrew Gilligan, who characterized the city as “still in the foothills” of being cycle friendly. Although Johnson has been a huge booster of cycling in London, putting £900 million ($1.4 billion) toward the project, the original idea has been a long time in the making. His predecessor Ken Livingstone, who became mayor in 2000, was vocal and active in pushing the cycling agenda and in 2008 announced £400 million ($624 million) in initiatives. Even before that, there was a long and steady campaign to raise the profile and the possibilities for cycling in the city. In the occasionally fractured world of Sydney cycling and cycling politics, not even the bike riders themselves claim to always play by the rules. But the reason they break the law, the great majority of cyclists say, is to protect themselves. A new study by researchers at the University of NSW, who interviewed 770 cyclists, found almost 95 per cent of them admitted to breaking the law at times while cycling. The reasons they gave, however, might be understood by those who have experienced the fraught and sometimes dangerous experience of cycling in Sydney. 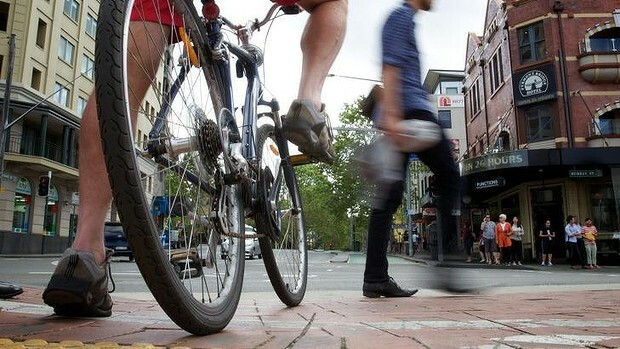 Cyclists nominated the differences in speed between vehicles and bikes, unsafe roads, poorly connected bike infrastructure and trying not to annoy drivers as motivations for flouting the road rules. "As vulnerable road users, cyclists are motivated to ensure their own safety by avoiding perceived danger from fast-moving vehicles in traffic and ensuring minimal conflict with drivers," said researcher Louise Shaw. One common infringement admitted to by cyclists is to push out in front of red lights to put a safe distance between themselves and cars. Another was riding on the footpath. Vince Bush, 50, who has cycled for most of his life said he was frustrated by the inadequate time green lights on bike lanes gave to cyclists. "I'm being treated like a pedestrian and I'm not, I want to go quicker, that's why I ride my bike," he said. Mr Bush also claimed a taxi driver had just abused him for being too slow. But other cyclists believe Sydney motorists' attitudes to cyclists have changed dramatically. Richard Barnsdall, who cycles up to 40 kilometres a day, said motorists had become far more aware of cyclists and that a mutual respect was growing. "The restrictions imposed on cyclists are a part of the cost of having a bike," he said. The survey's findings could, however, add to the arguments in favour of a licensing scheme to make it easier to penalise those who break the law. Roads Minister Duncan Gay, who did not respond to requests to comment on this story, has said he was increasingly persuaded that a licensing scheme for cyclists would improve safety in the city. 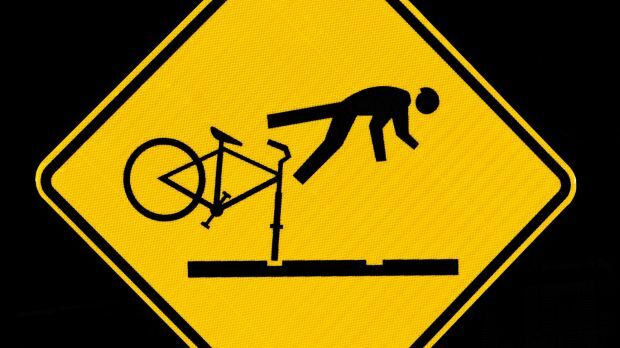 Pedestrian Council of Australia chairman Harold Scruby was not impressed by the survey's findings and condemned the actions of cyclists who break the law, saying they did so because they were unaccountable. "Why should pedestrians remain silent and say we will share it with you?" Mr Scruby said. "There are no rules, there's no risk assessment, there's no protection. It's got to a point where the footpath is no longer safe." "Fundamentally, what it boils down to is that cyclists are breaking the law because the infrastructure is not there," Ms Bartho said. "We need connected cycleways. The City of Sydney has come a long way but we have a long way to go." A City of Sydney spokeswoman said the best way to improve safety was to create separated cycleways where possible. "As our network grows, more people choose to ride and we have seen the number people riding in and around the city soar 132 per cent over the past four years," the spokeswoman said. 18 September 2014. It's probably the most enjoyable traffic jam I've ever been in. It's 8am and I'm crossing Queen Louise's Bridge, one of the pinch-points for anyone heading to the centre of Copenhagen, ringed as it is by waterways. Vehicles are strung out behind and in front of me, and hem me in on each side – but they're two-wheeled vehicles, on a broad path designated solely for bicycles. My fellow travellers defy glib categorisation. Most of them are dressed for work, from scruffy jeans to smart office attire; some are wearing helmets, but most are bare-headed in the bright sun. Their bicycles range from fancy to old-fashioned to utilitarian. 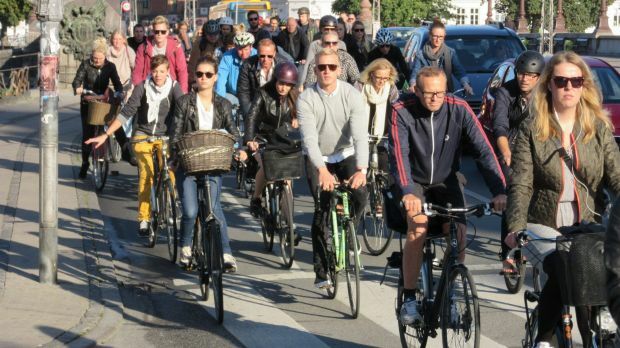 They are old and young, and women appear to outnumber men – or perhaps I'm so used to a predominantly male cycling culture, my mind is overcompensating. 17 September 2014. The number of serious injuries caused by road accidents in Victoria has not budged for a decade despite the road toll falling 26 per cent with road safety authorities admitting they are struggling to build safe cycling infrastructure quick enough to meet surging demand. A high number of injury claims and faster processing has meant a record 22,012 injury claims to the Transport Accident Commission in 2013/14. The senior manager of road safety at the Transport Accident Commission, Samantha Cockfield, said Victoria was doing well on reducing fatalities but faced a challenge with vulnerable road users such as cyclists and motorcyclists. "We have been doing very well concentrating on the very serious end, particularly fatalities with road side barriers, more roundabouts, safer cars and speed limits preventing the very serious end of it," she said. "What we have got though is upward pressure affecting day to day injuries... the really emerging group for us right now are cyclists and they are the ones that are growing faster than we can keep up with creating separated bike lanes," she said. In the five years to March 2014, the TAC recorded 1569 cycling accidents requiring hospitalisation. Melbourne’s newest iconic bridge was today officially opened and dedicated to the city’s adopted son, footballer and philanthropist Jim Stynes. The Stynes family, players from the Melbourne Football Club and members of the Reach Foundation joined together to unveil the innovative, 120 metre bridge in the Docklands. The Jim Stynes Bridge is the centrepiece of the $25 million redevelopment of the Yarra’s north bank. It is a much-needed connection for Melbourne’s cycling network and pedestrians, connecting the city, the Northbank waterfront, Docklands and Southbank. NEWCASTLE Cycleways Movement is confident it can secure state and federal funding to create a $50 million cycling network that would link all of Newcastle's suburbs. Newcastle council has already committed $15 million to the city's cycleways over the next 10 years and now the community group is about the launch a public appeal for more funds. Newcastle Cycleways Movement 's Bernard Hockings spoke about the ambitious plans at the Newcastle Institute's June forum last week. Cassandra Devine was riding along Flinders Street when a door flew open, throwing her from her bike. She did not break any bones but it shook her confidence - and changed her riding habits. She now makes a priority of looking for the safest route. ''Particularly since it happened, I have been much more aware generally, and much more aware of riding in a designated bike area,'' Ms Devine said. Among women, she is not alone. 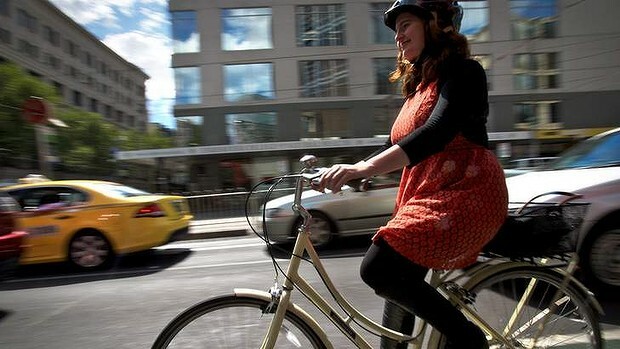 Preliminary results from a bicycle survey on Tuesday morning found women were choosing the city's safest routes into the CBD, including the segregated lane on La Trobe Street, where there was a 30 per cent increase in the number of female riders. The count, by the Bicycle Network, found routes judged ''safer'' were more popular with women than men. They favoured Napier Street in North Fitzroy, Rathdowne and Canning streets in North Carlton and the Upfield rail line bike path. ''It's impossible to ignore the conclusion that a sure way to increase the numbers of riders in Melbourne is to make the network safe and attractive to women - wherever good routes are created they take to them instantly,'' spokesman Garry Brennan said. He said there were more men than women on routes south of the city, where they were generally less safe. Bicycle Network grades routes by degrees: from no interaction with cars at one extreme to ''too narrow'' bicycle lanes on St Kilda Road, where men were found to outnumber women three-to-one. The count found key routes into the city carried between 600 and 1000 riders an hour during peak times. Mr Brennan said Docklands office workers were using bikes in greater numbers. Melbourne City Council has launched a campaign to help reduce fatalities and serious accidents by 20 per cent over five years. Lord mayor Robert Doyle said there were four road deaths, 236 serious accidents and 846 other accidents in the city in 2012. Most involved pedestrians and cyclists, he said. ''You can put up signs and you can levy fines, but in the end you need to change people's behaviour,'' Cr Doyle said. The campaign includes warning pedestrians to ensure they are alert and not distracted by smart phones or MP3 players. The council will run the program until June at hot spots, including Collins Street and St Kilda Road, where drivers will be warned about the risk of ''dooring'' and being distracted behind the wheel. Victoria Police Chief Commissioner Ken Lay has come out in emphatic support of cyclists' right to be on the road, stating that it is the responsibility of all motorists to be vigilant about bike riders' safety. Mr Lay's firm pro-cycling comments feature in a YouTube video clip that has not been officially released, but has been obtained by Fairfax Media. 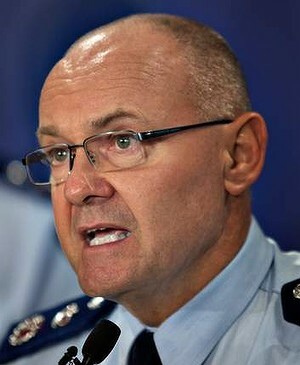 Police Chief Commissioner Ken Lay. The state's most senior policeman also uses the video to dispel two myths that are a frequent source of hostility towards cyclists – that motorists pay for the roads through their registration fees, and that cyclists are legally required to ride in single file.